Oasis rocker Liam Gallagher has no interest in smoking and boozing anymore, preferring a bubble bath to a wild night out. The Cigarettes & Alcohol hitmaker has lost interest in the hard-partying ways of his youth and has become more domesticated than ever now that he is in his 40s. “I put out my own rubbish," he tells British newspaper The Mirror. "I do the ­dishwasher. I do the cleaning when the cleaner hasn’t been (in). And I love a nice soak in a bath, as girly as it sounds, with a candle, man. You can just relax and come out like a Buddha." Liam is also happy to iron his girlfriend Debbie Gwyther's clothes before doing other chores such as picking up groceries at the store. The rocker is well-known for engaging in high-profile feuds, but after recently butting heads with actor Idris Elba and fighting with his brother Noel Gallagher for so many years, he insists he is committed to turning a page and atoning for all the upsets he's caused. “Sometimes we lose our way, I’m sorry for the hurt, I’ll be the first to say, ‘I made my own mistakes.’," he shares. "I know my life is full of ups and downs and dramas. I live on the edge. Every now and again I veer into murky waters and I get myself in a lot of s**t and that." 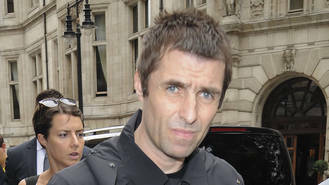 Liam infamously fathered a child with a mistress while married to ex-wife Nicole Appleton, leading to the collapse of their marriage, but the star admits he doesn't feel very remorseful over the impact of the 2014 divorce on their family. "Hopefully we can move on with it, especially with my kids anyway," the father-of-four says. "I know I’ve messed their lives up a bit but it’s not the end of the world. “I come from a broken f**king family and it didn’t do me any harm. I’m a top dad. You just have to do the right thing every now and again and no one is perfect."